We take a look at some of the best golf cart bags you can currently get for your money. If you’re an avid golfer, it’s important that you not only have a good set of clubs but have a good golf bag too. Modern golf bags can improve your golf course experience due to the conveniences that they bring. The latest bags are manufactured using super light materials and have plenty of storage space in them, to enable you to be fully prepared for your game. The best golf bags will have loads of space for clubs, golf balls, applicable apparel, and even food and drink. If you have a golf bag already, and it’s showing signs of deterioration, then it’s probably a good time to upgrade. There are two types of bags available where golfing is concerned. The first is the carry bag which has shoulder straps. This is ideal for those who like to walk around the course carrying their own gear. The second type is the cart bag. This style is specially designed to be carried around on a push cart or a motorized ride-on cart. This is the type of bag we’re going to review here. So without further ado, let’s take at look at the best golf cart bags currently on the market. The C130 is one of the best selling golf bags that Sun Mountain has released. The fact that this company has many other popular products in their inventory is a sure sign that they’re an authority brand for golfers. This bag has been specifically designed to be used on carts, and all pockets are front-facing for convenient access. Not all of the pockets are the same, however, as it has two pockets made out of cloth that are designed for storing valuables. The pass-through strap will hold it firmly in place and won’t hinder your access to the pockets. The C130 has 14 different dividers that will help you arrange your clubs neatly and allow you better access when selecting your club. This cart bag comes with several different styles of pocket, as well as having a special compartment for a rangefinder. Cart bumpers are rarely seen and are used to ensure that your bag is protected from the bumps and friction caused from being in a golf cart. The pass-through strap will hold the bag in place, without obstructing your access to all of the pockets. The wide opening makes this bag very easy to access. This will speed up your play and make it more fluid, as you won’t be struggling to pull out a particular club. The Sun Mountain Golf C130 has been designed to work with all standard sized carts. The 14 individual full-length dividers make it easy for you to locate and retrieve the specific club that you intend to use. Excluding the standard pockets, this cart bag comes with additional compartments to store valuables. One of these is specifically designed for a rangefinder. A raincoat is also provided with this bag, which will help to keep everything dry on a rainy day. The pockets are all forward facing which allows easy access, even if it is strapped in on a golf cart. As this is a top quality bag, it will cost you significantly more than the average cart bag on the market. The full dividers on this golf bag are made from fabric, so some clubs may not go in straight. A short amount of use will rectify this, though. The Sun Mountain Golf C130 has everything that you will ever need in a bag, without any unnecessary advanced features. The bag is very easy to strap in, and the forward facing pockets will allow continuous access. While it’s certainly not one of the cheapest, it will still cost you a lot less than some of the other top models that are currently on the market. This bag makes an excellent purchase for any golfer who wishes to rectify their mobility needs on the course. The Callaway Org 14 is a great bag that has a 14-way club divider system, as well as 12 individual pockets to store all of your golfing essentials. It’s very lightweight and made from high-quality material, which will ensure that you will get a lot of use of it on the green for years to come. The whole bag weighs a mere 5.6 lbs, which means that even when fully packed with clubs and other accessories, the overall weight will still be light enough to push and pull comfortably. The high-quality handle allows this bag to be lifted easily, as well as being made so strong that it won’t break during the lifetime of the bag. 14-way golf club dividers will grant you adequate space for all of your clubs. The 12 different pockets that this golf cart bag has will allow you to hold various items, without the risk of losing or damaging them. The umbrella sleeve gives you a place to store your umbrella, so that you don’t get caught out in the rain. The E-trolley base system allows this bag to be secured to any golf cart, without the need to purchase a special trolley. This bag has adequate pockets to suit all of your needs. In fact, it’s likely that you won’t even utilize half of these pockets in most circumstances. It’s very light, even when fully kitted out. The bag design has made it possible to be used as a carry bag without the need of a trolley if you don’t wish to take a cart on the course. The design will allow it to fit on most push and pull carts with ease. Most of the color schemes that this golf bag comes in are quite vibrant, which means that you will likely need to clean it a lot more than others, as dirt will show up a lot easier. It’s also fairly costly when compared to the average golf cart bag. However, this does help assure the quality of the product. The Callaway Org 14 is a great quality golf cart bag, that is really light and has more storage than you are likely to ever need. Although priced fairly high, you will certainly not need to purchase another golf cart bag for the foreseeable future. The latest version of this bag has become very popular on the golf scene due to its quality and convenience. This stylish bag is 15-way and has eight individual pockets. The large beverage pocket is a must for those who enjoy a refreshing drink while playing golf. An incredibly sturdy and stylish golf bag. It weighs 7 lbs but comes with a 15-way top with massive, high-quality dividers. Eight zipped pockets will allow you to store as much equipment and apparel as you could possibly need, with one of them being an insulated beverage pocket. Anti-flex walls and polyester fabric make this bag incredibly durable. The beverage cooler is capable of storing six cans, or a large bottle with ease. It has a specially made rangefinder pouch, which provides additional protection for your expensive gadget. Easily accessible pockets with a stylish design. Highly durable, and can support itself on a flat surface, even if fully equipped. The dividers are not full-length, which is rare to find in a bag of this price and quality. Some of the pockets are on the side, which can mean that they aren’t accessible if the bag is securely strapped in on either side. The Ping Pioneer Golf Cart Bag offers a lot for its price, especially if you remember that purchasing a high-quality bag will save you money in the long run. It’s also one of the nicest looking bags available if you go for the darker color schemes. With ample room for valuables and clubs, this is definitely a bag to consider purchasing. 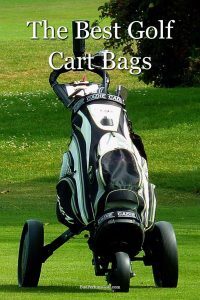 The Bag Boy Golf Chiller Cart Bag is another bag that has been designed specifically for those who enjoy drinking cold refreshing beverages while they play a round of golf. Not only that, but Bag Boy has gone one step further and has provided a removable insulated cooler bag, in addition to the chiller pocket. 15 way top which includes full-length dividers. Insulated cooler bag inside a chiller pocket. A total of nine pockets provide ample storage, as well as three quick access mesh pockets on the outside. Soft grip lift handles as well as a towel holder ring. Umbrella holder and rain hood are included, to ensure you stay dry. The cooler can hold six cans and is removable. Nine pockets provide loads of space to store items. Some of these pockets have been specially designed to store golf balls, as well as a fleece pocket for valuables. The high-quality divider will help you to choose your correct club with ease. The dark color scheme bags look especially smart. This bag looks a lot bulkier than others that are available. Although the darker color scheme bags were a pro, there isn’t a massive variation in color schemes overall. The cooler bag can hold six cans, but it can get very tight. If you don’t mind the chunkier style of bag and are someone who likes to have the option of bringing cold food and drink with them onto the green, then this bag will unmistakably suit your needs. Nine pockets is plenty of room to bring any items that you require to have with you, with ease. We have decided to crown the Sun Mountain Golf C130 as our choice as the best golf cart bag on the market. It looks great, has many different color options, and is of fantastic quality. The smart strap system that attaches the bag to the riding cart will make sure it doesn’t fall off while navigating the course, as well as not getting in the way when you’re trying to select your club. Although it’s slightly more expensive than some of the other bags that are available, the additional price is definitely worth the investment.